Managing people is difficult. With disengagement and turnover on the rise, many managers are scratching their heads wondering what to do. It's not that we don't dream of being great managers, it's just that we haven't found a practical and efficient way to do it. Through the story of one company, The Dream Manager explores the connection between the dreams we are chasing personally and the way we all engage at work. 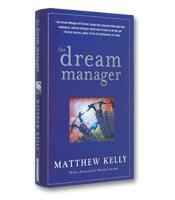 Taking on the growing problem of employee disengagement, The Dream Manager explores the dynamic collaboration that is unleashed when people work together to achieve company objectives and personal dreams. How a company can become the best version of itself by helping employees become better versions of themselves. How to change the way you manage and relate to people. How to recognize the dreams of those that you lead. How to inspire your people to achieve their visions. How to unleash the power of dreams to keep your business going.